Beef tenderloin, or eye fillet (New Zealand and Australia), is cut from the loin of a steer or heifer. The tenderloin refers to the Psoas major muscle along the central spine portion, which more or less hangs between the shoulder blade and hip socket. This muscle tissue does very little work, so it is the most tender part of the cow. The tenderloin can either be cut for roasts or for steaks. When left whole, the tenderloin is known as a fillet or a "Chateaubriand". 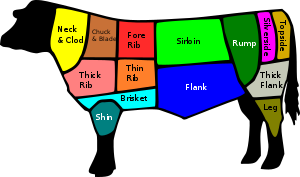 When sliced, it forms various steaks. Those toward the loin end of the piece, when cut into slices one to two inches thick, are known as filets. Sometimes, the cuts are called filet mignon, while at other times filet mignon refers to a dish made with a beef tenderloin filet, not the cut itself. Other portions of the tenderloin, when cut into steaks, are typically called tenderloin steaks, not filets. Whole tenderloins are often sold as PSMOs (pismos), which is short for peeled, silver skin, and side muscle left on. The PSMO is vacuum sealed in plastic, and can be safely refrigerated longer than many other cuts of meat. PSMOs also offer considerable savings over smaller cuts as they require little handling by the butcher, but obviously require more preparation on the part of the chef. Since it is the least stringy part of the animal, most beef dishes requiring high quality meat, such as steak tartare, are ideally made from the tenderloin. Page modified 16:44, 17 August 2014.